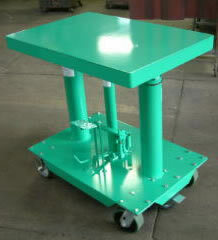 material handling table that can be used in confined spaces. web frame. The top is guided by extremely rigid guide tubes. maintenance in the most demanding environments. The HT series is engineered with ergonomics in mind. casters. The position of the table can be anchored through its rubber pad telescoping floor lock. dimensions, and much more can be accommodated. Call for information on powered models. 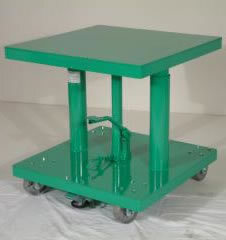 Heavy duty, high capacity mobile utility table. Heavy-duty steel plate, welded web frame construction. Treadle guide provides superior durability and ergonomics. Foot operated hydraulic release lever. Sure-grip rubber pad telescoping floor lock. Low rolling resistance, heavy duty steel or poly-steel wheels. Push handle, guide tube covers (bellows), and extended top plate clamp lip. Zero drift mechanical height locks for long term position holding. Tool safe soft top and 2.5 clamp lip top for work bench applications. 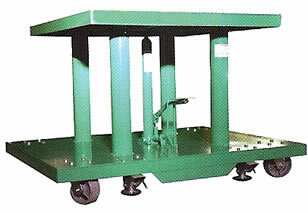 Conveyor or ball transfer tops with or without manually operated push pull mechanism. Die handling boom for die separation and maintenance. Table Top L x W 20" x 30" 20" x 30" 20" x 30" 20" x 30" 20" x 30" 20" x 30"
Raised Height 48" 46" 44" 40" 36" 32"
Lowered Height 30" 28" 26" 24" 22" 20"
Lift 18" 18" 18" 16" 14" 12"
Caster 5" 5" 5" 5" 5" 5"
NOTE: Steel casters are standard, Polyurethan and Phenolic options are available. Table Top L x W 30" x 30" 30" x 30" 30" x 30" 30" x 30" 30" x 30" 30" x 30"
Table Top L x W 30" x 48" 30" x 48" 30" x 48" 30" x 48" 30" x 48" 30" x 48"
 Easier method for pushing and pulling loads to and from the unit.  5-lb. effort required to crank the handle.  Fits 3 sizes of table tops. 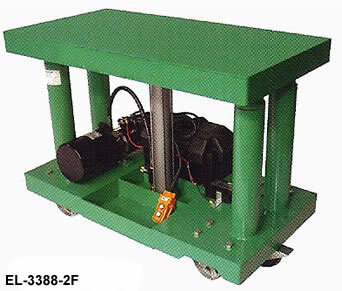  Sold as stand alone unit or assembled onto table. L x W 30" x 20" 30" x 30" 48" x 30"
L x W 23" x 20" 23" x 20" 23" x 48"
Weight 123 lbs. 143 lbs. 225 lbs. 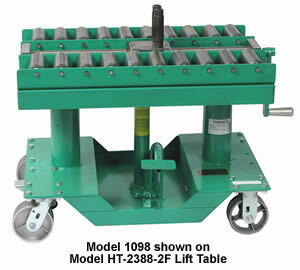 your source for material handling equipment.